An Historical Perspective of the Development of Molecular Imprinting (H.S. Andersson, I.A. Nicholls). Introduction. Polyakov invents molecular imprinting. The contributions of Pauling and Dickey. Theories of antibody formation. Bio-imprinting in the 1940s. Dickey invents molecular imprinting. Methods for preparing molecularly imprinted silicas. The mechanism(s) of selectivity. More studies on Dickey's system - molecular footprints? An association mechanism? Objections to the association mechanism. Applications of molecularly imprinted silicas. Separation. Column chromatography. Thin layer chromatography. Structure elucidation. Catalysis. Other applications. Making money using molecular imprinting? The decline of imprinted silica research. Molecular imprinting in organic polymers. Conclusions. References. Fundamental Aspects on the Synthesis and Characterisation of Imprinted Network Polymers (B. Sellergren, A.J. Hall). Introduction. Free radical polymerisation. Initiation. Propagation. Termination. Steady state. Chain transfer. Inhibition. Copolymerisation. Tacticity. Copolymers of divinylmonomers and monovinyl monomers. Pregel regime and kinetics. The system EDMA-MMA. The EDMA-MAA MIP system: primary structure. The EDMA-MAA MIP system: secondary structure. Build-up of the porous structure - the tertiary structure. Site stability, integrity and accessibility. Polymer porosity and swelling. Thermochemically versus photochemically initiated polymerisations. The cross-linking monomer. Extraction of template. Functional group titrations. Binding site location. Characterisation techniques for cross-linked vinyl polymers and MIPs. Elemental analysis. Gravimetric analysis. Nuclear magnetic resonance spectroscopy. Infrared spectroscopy. Fluorescence probes of network solvation. Pore structure in the dry state. Gas sorption measurements. Mercury penetration. Surface areas. Pore volume. Pore size distribution. Pore structure in the swollen state. Thermal analysis. References. Thermodynamic Principles Underlying Molecularly Imprinted Polymer Formulation and Ligand Recognition (I.A. Nicholls, H. S. Andersson). Introduction. Physical principles underlying MIP preparation. Physical principles underlying MIP-ligand recognition. Conclusions. References. Molecular Imprinting with Covalent or Stoichiometric Non-Covalent Interactions (G.Wulff, A. Biffis). Introduction. The concept of imprinting. The optimisation of the polymer structure. The role of the binding-site interactions. Examples of covalent interactions in molecular imprinting. Boronic acid-containing binding sites. Other types of covalent binding. Covalent binding during imprinting and non-covalent binding during equilibration. Molecular recognition and catalysis with stoichiometric non-covalent interactions. References. The Non-Covalent Approach to Molecular Imprinting (B. Sellergren). Introduction. Structure-binding relationships. Examples of imprinted chiral stationary phases (CSPS). High enantioselectivity, high substrate selectivity. High enantioselectivity, low substrate selectivity. Antibody-like recognition. Adsorption isotherms and site distribution. Batch rebinding experiments. Results from frontal analysis. Adsorption-desorption kinetics and chromatographic band. broadening. Adsorption-desorption kinetics in batch rebinding experiments. Peak dispersion and assymmetry in chromatography using MIP-phases. Factors influencing the recognition properties of MIPs. Choice of the functional monomer. Influence of the number of template interaction sites. Thermodynamic considerations. Concentration of functional monomer and template. Polymerisation temperature. Polymerisation pressure. Polymerisation diluent. Influence of the template shape. Influence of the monomer-template rigidity. Studies of the monomer-template solution structures. Post-treatments affecting affinity, selectivity and mass transfer properties. Thermal annealing or curing. Esterification. Hydrolysis. Medium dependence in the rebinding to MIPs. Effect of swelling and porosity in different media. Effect of template structure. Templates of category 1. Triazines. N-protected amino acids. . 9-Ethyladenine. Other examples. Templates of category 2. Templates of category 3. Mobile phase optimisation. Conclusions. References. Metal-Ion Coordination in Designing Molecularly Imprinted Polymeric Receptors (P.K. Dhal). Introduction. Binding site interactions in molecularly imprinted polymers. Advantages of metal-coordination interactions in molecular recognition. Design of molecularly imprinted polymers based on metal-coordination interaction. Bulk polymerised metal-coordinating polymeric receptors. Surface modified metal-coordinating imprinted polymers. Applications of metal-coordinated imprinted polymers. Sorbents for separation media. Recognition and binding of proteins. Catalysis. Sensors. Conclusions and outlook. References. Covalent Imprinting using Sacrificial Spacers (M.J. Whitcombe, E.N. Vulfson). Introduction. Sacrificial spacer method. Combination of non-covalent and sacrificial spacer methodologies. Amino acid sequence specific polymers. Conclusions. References. Molecular Imprinting - Approaches using Inorganic Matrices (D.Y. Sasaki). Introduction. Sol-gel chemistry. Two-dimensional matrices. Three-dimensional matrices. Thin films. Bulk structures. Separations. Catalysis. Zeolites and supramolecular imprinting. Conclusion. References. Imprinting Polymerisation for Recognition and Separation of Metal Ions (K. Tsukagoshi, M. Murata, M. Maeda). Introduction. Survey of preparation methods of metal ion-imprinted resins. Early studies on metal ion-imprinting . Method 1 in scheme 1. Method 2 in scheme 1. Metal ion-imprinted microspheres prepared by reorganisation of coordinating groups on a surface. The concept of surface imprinting by the use of seed emulsion polymerisation. Preparation and physicochemical characterisation of the microspheres. Metal adsorption behaviour of the microspheres. FT-IR and ESR studies on Cu(ii)-loaded microspheres. Metal ion-imprinted resins prepared by o/w emulsion polymerisation. Surface imprinting by use of o/w emulsion. Potassium oleate and dioleyl hydrogenphosphate as functional monomers. Metal ion-imprinted resins by o/w emulsion polymerisation. Metal ion-imprinted resins prepared by w/o emulsion polymerisation. Imprinting polymerisation in w/o emulsion. Dioleyl phosphate as functional monomer with &ggr;-rays irradiation. Applications of metal ion-imprinted resins and future aspects. Biomimetic applications. Chemical sensor and applications. Other techniques using metal ion-imprinting. Conclusions. References. Bio-Imprinting: Polymeric Receptors with and for Biological Macromolecules (P.K. Dhal, M.G. Kulkarni, R.A. Mashelkar). Introduction. Molecular imprinting using biological. Macromolecules as matrix forming materials. Molecularly imprinted matrices using proteins as the precursors. Molecularly imprinted protein matrices for recognition and separation. Molecularly imprinted protein matrices for catalysis. Molecularly imprinted matrices using carbohydrates as the precursors. Molecular imprinting of biological macromolecules and assemblies. Protein mimetic imprinted gels: responsive hydrogels exhibiting biomolecular recognition properties. Conclusions and outlook. References. Surface Imprinting of Microorganisms (N.Perez, C. Alexander, E.N. Vulfson). Introduction. Imprinting of microorganisms. Methodology. Potential applications. Conclusions. References. Polymerisation Techniques for the Formation of Imprinted Beads (A.G. Mayes). Introduction. Special considerations relevant to molecularly imprinted beads. Techniques that have been used to make molecularly imprinted beads. Imprinted bead production methods. Utilising the pores in preformed beads. Suspension polymerisation in water. Suspension polymerisation in fluorocarbon liquids. Dispersion polymerisation methods. Aqueous two-step swelling method. Aerosol polymerisation methods. Surface rearrangement of latex particles. Conclusions and future perspective. References. Techniques for the In Situ Preparation of Imprinted Polymers (J. Matsui, T. Takeuchi). Introduction. Molecular-level design. Morphology design. In situ imprinted polymer rod. Polymer rod as chromatographic stationary phase. Tool for selecting functional monomer. In situ dispersion polymers. Use of imprinted affinity media in solid phase extraction. Use of imprinted affinity media in electrophoresis. In situ molecular imprinting for batch applications. Batch-type in situ polymer preparation. Combinatorial method for molecular imprinting. Conclusions. References. Application of Molecularly Imprinted Polymers in Competitive Ligand Binding Assays for Analysis of Biological Samples (L.I. Andersson). Introduction. Use of MIPs as antibody mimics. Organic solvent-based assays. Aqueous buffer-based assays. Selectivity. Sensitivity. Non-radioactive assays. Conclusions and future outlook. References. Molecularly Imprinted Polymers in Solid Phase Extractions (B. Sellergren, F. Lanza). Introduction. Multi-purpose SPE phases. High affinity SPE phases. Molecularly imprinted solid phase extraction (MISPE). Off-line protocols. Sample clean-up of biological fluids. Extraction of analytes of environmental concern. On-line protocols. Extraction of nicotine. MISPE with pulsed elution. On-line coupled column approaches. The development of new MISPE protocols. Template bleeding - an unresolved issue in MISPE protocols. Conclusions. References. Capillary Electrochromatography Based on Molecular Imprinting (L. Schweitz, S. Nilsson). Introduction. Capillary electrochromatography. Short introduction to capillary electrochromatography. Equipment. Molecular imprinting. Capillary electrochromatography based on molecular imprinting. Adjustment of MIPs to columns of capillary format. In situ dispersion polymerisation. Gel-entrapped MIP particles. MIPS as pseudo-stationary phase. MIP coatings. In situ prepared MIP monoliths. Electrochromatographic separations. Conclusions and future outlook. References. Molecularly Imprinted Polymers in Enantiomer Separations (M. Kempe). Introduction. Covalent molecular imprinting. Non-covalent molecular imprinting. Polymer systems. Monomers and cross-linkers. Polymerisation solvents. Polymerisation methods. Chiral chromatography. HPLC. TLC. CE and CEC. Other methods. Conclusions. References. Biomimetic Electrochemical Sensors Based on Molecular Imprinting (D. Kriz, R.J. Ansell). Introduction. Chemical sensor technology. Chemical sensors. The transducer. Electrochemical transducers. Other transducers. The recognition element. Physicochemical recognition elements. Biological recognition elements. Biomimetic recognition elements. Sensors utilising molecularly imprinted recognition sites. Approaches using imprinted macroporous methacrylate, acrylate or vinyl polymers. Early approaches. Sensors based on accumulation in the polymer. Sensors based on permeation through the polymer. Templated inorganic materials. Gate sites in surface monolayers. Templating in conducting and redox polymers. Ion sieving. More complex systems. Redox polymers. Composite materials. Conclusions and outlook. References. Ionic Sensors Based on Molecularly Imprinted Polymers (G.M. Murray, O.M. Uy). Introduction. Synthesis of ion selective molecularly imprinted polymers. Monomer selection and preparation. Preparation of complexes. Preparation of polymers. Testing for selectivity. Electrochemical sensors. Conductivity. Ion-selective electrodes. Imprinted polymer ion-selective electrodes. Spectroscopic sensors. Transition metal ion chromophores. Lanthanide ion chromophores. Organic chromophores. Optical probes. Flow injection analysis. Future perspectives. References. Toward Optical Sensors for Biologically Active Molecules (S. McNiven, I. Karube). Introduction. Optical sensors. Ellipsometry. Linear dichroism. Colorimetric detection of solvent vapours using MIPs deposited on quartz crystals. Surface plasmon resonance. Fluorimetry. Fibre optic detection of fluorescent template. Effect of template on formation of fluorophores within the MIP. Competition of template and fluorescent reporter. Imprinting of silicas with fluorophores. Covalent and non-covalent imprinting using fluorophores as functional monomers. Formation of fluorescent complex upon binding of metal ion template. Interaction of ancillary ligand with fluorescent metal complexes within the MIP. Determination of fluorophores using MIPs formed on quartz crystals. Quenching of functional monomer fluorescence upon binding of analyte. Competitive fluoroimmunoassay. Sensors based on liquid chromatography. Chloramphenicol sensors. Bulk imprinted polymers. In situ imprinted polymers. Fluorescent detection of &bgr;-estradiol. Displacement technique. Direct measurement. Outlook. References. Non-Covalent Molecularly Imprinted Sensors for Vapours, Polyaromatic Hydrocarbons and Complex Mixtures (F.L. Dickert, O. Hayden). Introduction. Chemical sensors. Evidence for molecular recognition. Principles of non-covalent imprinting for sensors. Optical sensor applications. Mass-sensitive devices. Differences between chromatographic and chemosensory applications. Conclusions. References. 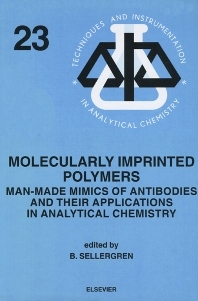 This book is divided into 5 sections starting with an historic perspective and fundamental aspects on the synthesis and recognition by imprinted polymers. The second section contains 8 up-to-date overview chapters on current approaches to molecular and ion imprinting. This is followed by two chapters on new material morphologies and in the last two sections various analytical applications of imprinted polymers are given, with the last four chapters devoted to the promising field of imprinted polymers in chemical sensors. The authors of this volume have widely different backgrounds; mainly polymer chemistry, organic chemistry, biochemistry and analytical chemistry, which means that this book has an interdisciplinary character and should appeal to a broad audience. For chemists and biochemists with an interdisciplinary interest in molecularly imprinted polymers.